Diabetes damages the body’s normal circulation which is why people with diabetes may have problems with circulation to their legs, kidneys, heart, brain, and eyes. At least 50 percent of all diabetics will develop diabetic retinopathy (abnormal retinal blood circulation), and the incidence increases with the duration of the disease. After 20 years, more than 90 percent of diabetics have some degree of diabetic change. Diabetic retinopathy is a leading cause of blindness in the United States in middle-aged adults. Fortunately, new methods of treatment in recent years have decreased blindness among diabetics and have increased the possibility of retaining useful vision. 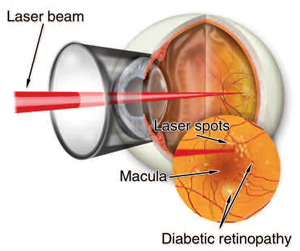 There are two main types of diabetic retinopathy: non-proliferative and proliferative. In non-proliferative diabetic retinopathy, there is leakage caused by damage to small retinal blood vessels (capillaries). This leakage allows proteins and lipids from the blood to accumulate in the retina, causing swelling. If this swelling occurs in the area of central vision (macular edema), sight may be significantly diminished. As the disease progresses, retinal capillaries may also become closed off, resulting in poor retinal nutrition. Lack of circulation to the center of vision (macular ischemia) can result in severe and permanent loss of central vision. When there is widespread impairment of retinal nutrition due to capillary leakage and closure, proliferative diabetic retinopathy develops. The poorly nourished retina sends out a chemical “distress signal” which causes new blood vessels to grow (proliferate) on the retinal surface. Unfortunately, these new blood vessels are very fragile and often rupture, allowing bleeding to occur within the eye (vitreous hemorrhage). Scar tissue can also grow around the abnormal blood vessels which may lead to retinal detachment and possible permanent blindness. The proliferative form of diabetic retinopathy is present in approximately 20 percent of patients with diabetes of ten years duration. In the early stages of diabetic retinopathy, there are usually no symptoms. Therefore, it is very important that all patients with diabetes have a comprehensive dilated eye examination at least once a year before any symptoms develop. During this exam, your eye specialist can check for any signs of damage to the retina and optic nerve, including leaking blood vessels, swelling of the macula, and growth of new vessels. To help prevent the development and progression of diabetic retinopathy, patients are urged to control their blood sugar, blood pressure, and cholesterol levels. Treatment is aimed at the main causes of decreased vision. Macular edema: Macular edema is caused by damage to retinal capillaries which leads to leakage of blood products into the retina. Large clinical trials have shown that the application of focal laser to areas of retinal swelling can stabilize the vision and reduce the risk of vision loss by 50 percent. The injection of steroids, such as triamcinolone, either around or into the eye has also recently been found to be of benefit. Side effects of steroid injections include increased eye pressure and cataract formation. A new class of medications target the “distress signal” sent out by a poorly nourished retina. These agents bind and block the action of vascular endothelial growth factor (VEGF) and can be directly injected into the eye. Adverse effects of injections of these agents into the eye are rare but include bleeding, infection, cataract, and retinal tear or detachment. Patients may need multiple procedures or a combination of treatments to control the leaking fluid. Proliferative diabetic retinopathy: Widespread impairment of retinal blood circulation leads to the development of new, fragile blood vessels. Large clinical trials have shown that a procedure called scatter laser photocoagulation can be effective in halting or reversing new vessel growth. Many eyes, even without visual problems, need to begin laser treatments if there are certain abnormal vessels present. Those eyes, having no visual problems, must be detected by examination. Overall, the incidence of blindness over two years can be reduced by 66 percent for eyes with new vessels on the optic nerve and by 37 percent for eyes with new vessels in other locations. The laser treatment consists of applying multiple laser burns to the peripheral retina, often divided into several sessions. Although mildly uncomfortable, the treatment usually can be done without the need for local anesthesia. The main complications from treatment are loss of some peripheral vision, a decrease in night vision, occasionally some loss of central vision, and possible mild enlargement of the pupil. If laser treatment is needed, the risk factors of not being treated are much higher than the risk of being treated. Again, a new class of medications targeting VEGF produced by poorly nourished retina can be directly injected into the eye. The anti-VEGF drugs Avastin and Lucentis have been used with good results in managing proliferative diabetic retinopathy, often along with scatter laser photocoagulation treatment. Vitreous hemorrhage and tractional retinal detachment: In cases where laser treatment is not successful in preventing hemorrhage into the eye or when a retinal detachment from scar tissue has occurred, a type of surgery called vitrectomy is often helpful. In the operating room, a microsurgical instrument is inserted into the eye, and the blood-stained vitreous is removed and replaced by a clear sterile solution. Fibrous bands which may cause retinal detachment are removed to allow the retina to flatten and return to a more normal configuration. Vitrectomy remains an operation performed only on eyes in which no other treatment is useful. Approximately 60 percent to 70 percent of selected eyes, otherwise hopelessly damaged, can be restored to at least ambulatory vision. Some eyes, however, actually can return to very good vision. It is critical for all diabetics to have a comprehensive eye exam at least once a year to evaluate for the presence of retinopathy. Patients should remember that both macular edema and proliferative retinopathy can develop without symptoms. Patients with visual symptoms and/or visual loss, at any stage of the disease, should be evaluated without delay to find out the cause of the visual change. Early detection and timely treatment can prevent vision loss.